Our health system in Zimbabwe- A view of a wounded healer! I like to share my personal experiences, because I believe that my readers can relate to them and may thus find inspiration for confronting their own health challenges. In other words, my medical knowledge does not come merely from my academic qualifications, reading books or periodicals or from interacting with patients, but from events in my own life. I want people in similar situations to understand and get healed from knowing that someone experienced that situation and is alive today. I am not picking on my wounds and making them fresh again. But, even I can face a similar situation, and use the path to healing from the last incident to overcome the situation. On the evening of 19th October 2005, I had finished my shift as a junior doctor in Psychiatry in East Kent UK, and on my way home, when I received a phone call from Zimbabwe. It was bad news; my younger brother, who was 19 years, had died of kidney failure. As if this was not enough bad news, my father was also in hospital, suffering from jaundice ( yellow eyes). It later turned out that my father had cancer of the gallbladder. He was operated on, but, sadly died on the 29th October 2005, ten days after the death of my young brother. 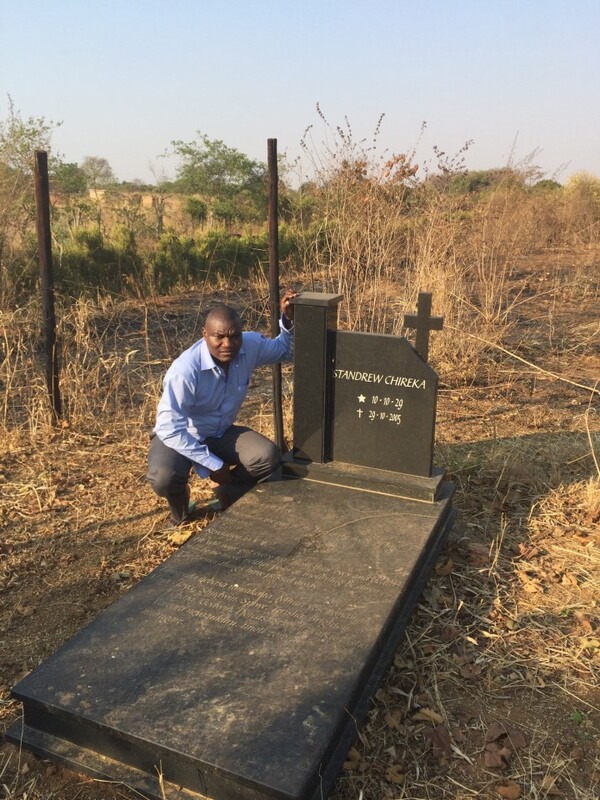 The whole family was shattered by this double-tragedy, but I was hit hard in a particular way; my immigration status was not yet resolved, meaning that I could not travel back to Zimbabwe to pay my respects and be with my relatives at this very difficult time. My young brother started to have kidney problems 2 years before his death and had to rely on dialysis ( kidney machine). It was a challenge for us as the medicines needed for the dialysis were not available at all in government hospitals and were not easily available in the private pharmacies. We had to team up with local pharmacists to get the medicines from South Africa. We made sure we had enough supplies as my brother needed to be dialysed 3 times a week. He made a good recovery and led a near normal life for those two years. He would tell me how lucky he was to have relatives who were able to source medication for him outside the country. He told me how so many people were dying because they could not source the medication. My brother got very close to a certain kidney-failure patient who became like his mentor and helped him to cope. He would share his medication with that lady without our knowledge, but this noble gesture only bought her just a little more time. Sadly, she died due to the continued non-availability of medication to dialyse her. This was a huge blow to my brother. Sadly we did not realise the impact of this lady’s death his mental well being. My brother lost the will to live and carry on with life. Unbeknown to us, he stopped attending the dialysis sessions. For three months, he still obtained the medication from the pharmacy, but he would give it to other patients. He made us believe that he had made a huge recovery and no longer required regular dialysis. My brother clearly had developed depression from the loss of the patient he had regarded as his mentor, and also the trauma of seeing people around him dying on a daily basis. It is to be remembered that he was a teenager. I wish we, his family, had appreciated this at the time. Perhaps, if there had been an association or other organisation for kidney-patients, these problems would have been identified at their onset and he would have been given the support he needed. Maybe, he would be alive today. Or, if only our health service delivery system was functioning, my brother would have been alive today. There are a lot of “ifs”, none of which, I concede sadly, cannot bring my brother back. My brother managed to do well for three months without dialysis. But, one day, he got worse, and was rushed to the hospital. On arrival, he was found to be experiencing severe kidney failure. It was too late, and he died the following day. It was then we learnt that he had not been attending his regular dialysis sessions. No one from the hospital had looked for him or bothered to contact the next of kin to find out why he was not attending. The family members also did not verify if the young man was attending his sessions as required. We assumed that he was old enough and eager to get better so would attend his sessions without supervision or monitoring. Both us-the family- and the doctors did not foresee some of the problems associated with chronic illnesses and also the effect of preventable deaths on the mental well being of my brother. While this was going on, my father was diagnosed with a blockage to his gallbladder which was making him to have yellow eyes. We engaged a private surgeon, who discovered that my father not only had cancer of the gallbladder, but it spread throughout the entire stomach. The surgeon stitched up my father without operating on the blockage. We paid him nonetheless for the procedure, after about a week, took my father from the hospital to a nursing home. My father never recovered from surgery; he died on the same day he arrived at the nursing home. Before the operation he was talking and walking although he had yellow eyes. To us the relatives (my medical hat off), apart from yellow eyes, he was fine. The question that is left unanswered is; why was the operation carried out? Was there no way of finding out the extent of the cancer without surgery? Did the operation in fact speed up the dying process? Is it ethical or moral to charge huge fees when the surgeon has not done the actual procedure paid for? I understand that the surgeon would have prepared for a 4 hour operation but did only an hour’s work. Would it not been better to offer a discount in those circumstances? It was difficult for us a family to come to terms with the reality of our health system in Zimbabwe. Losing two family members ten days apart is difficult to accept. It would be easy to blame the surgeon who operated on my father or, the physician who was responsible for the care of my brother or the main culprit; the government. Our national leaders have a lot to answer for our tragedy, and I can use all the adjectives available to describe how inept they are or how angry we were. But we counted our losses and decided to move on. I was called to action when I continued to hear the similar stories being narrated by many people. Some of these stories are worse than ours. Years later, there is no sign of things getting better in Zimbabwe. On the contrary, they look set to get worse. In the past, I joined the bandwagon of armchair activists who just talked without taking action, but this talking has not taken us anywhere . We have not moved an inch and we are continuing to lose innocent lives unnecessarily. I remember forming a company that helped the Zimbabwean diaspora to pay for medical treatment of their loved ones back home. The company did well initially, but had to close it when the multi-currency system was adopted to replace the Zimbabwean dollar. I have also formed a company to try and help our people to go to India to seek medical help but all these efforts do not address our main problems. The status quo is untenable, that is clear from any ideological angle. We cannot continue to point fingers at each other without doing something about it. It is now requiring us to think outside the box and to try and see what we can do to work within the constraints that we currently have. World over, we know that the demand for healthcare is rising but resources are getting more and more scarce. This calls for new ways of working , a new culture of accessing our health system and funding it to make sure that the resources are used efficiently. I have lost my loved ones and you have lost yours, so let’s do something to help the situation. We cannot wait for political leadership which happens every five 5 years . We need to see how we can work in VUCA ( Volatile, Uncertain , Complex and Ambiguous) environment such as the Zimbabwean health system. I have decided to compliment the need for change by looking at what is in our grasp already, particularly what Funders ( medical aid societies) , Providers (doctors ) and Service Users (patients) can do to help the situation. Let’s engage, as I take this further in my next article called – Bringing innovation to our health system – a look at how Providers, Funders and Service users can work together for the benefit of everyone. I will take you through what we are already doing to achieve our vision. May the souls of my father and young brother and your loved ones rest in peace. May their death call you to action to do something about our health system. They did not die in vain !